Artsy Bites: Sweet Smokey Bacon! - Add a bit salt to a pot of water (to flavor the Brussels sprouts), and bring it to a boil. - Carefully cut the Brussels sprouts in halves, such as to not detach too many leaves. - Drop the sprouts halves in the boiling water for 2-3 minutes. They cook very quickly. - Next, we'll give the sprouts some color. Heat up a flat cooking pan, then place the sprouts face-down. They'll start turning brown in about a minute. Remove them from the pan once you're happy with the color. - Separately, cut some smoked bacon into pieces (about the size of a thumb). - Chop half an onion into medium-sized pieces. - Place the smoked bacon in a frying pan, and turn the heat to medium. Add the chopped onion as soon as some of the fat starts melting. Cook on medium heat for about 5 minutes. Add a pinch of salt and pepper (enough to bring some flavor out), then turn the heat to medium-high. Cook until the onion changes color to dark yellow or brown (about 5-10 minutes). - Drain the fat away. 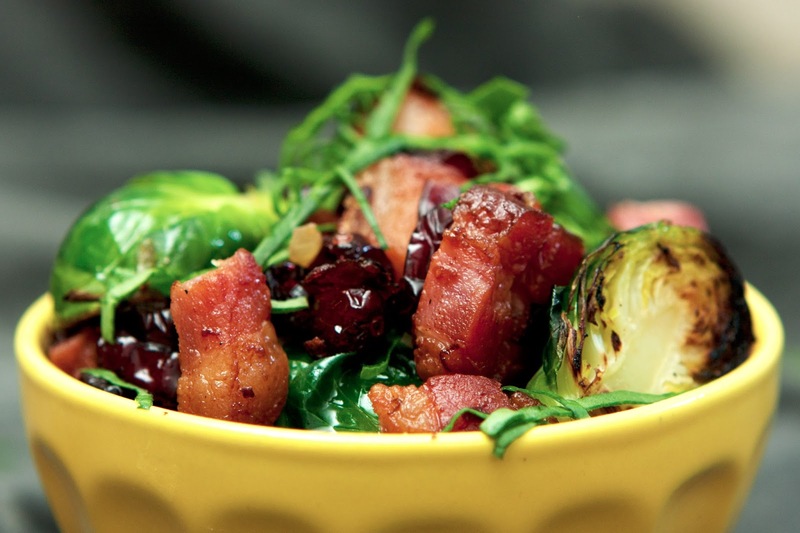 Mix the cooked bacon and onions with the brussels sprouts halves. - Sprinkle the balsamic vinegar on top, and mix. - Serve while the bacon is still warm. - Accompany the dish with something yellow (it nicely compliments the red of the bacon and cranberries, and the green of the brussels sprouts). For example, use a yellow bowl to serve the dish (as in the photo above). - Slice the extra Brussels sprouts leaves that fall off during halving or boiling. Use those shreds to top the dish.